Since President Obama was inaugurated, there have been over two thousand six hundred arrests of activists protesting in the U.S. Research shows over 670 people have been arrested in protests inside the U.S. already in 2011, over 1290 were arrested in 2010, and 665 arrested in 2009. These figures are certainly underestimate the number actually arrested as arrests in U.S. protests are rarely covered by the mainstream media outlets which focus so intently on arrests of protestors in other countries. 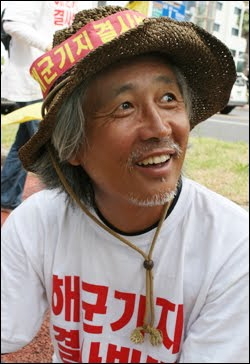 On Jeju Island, South Korea, a jailed local opponent of a new U.S. navy base is in his 53rd day of a hunger strike. Korea’s most prominent film critic, University professor Yang Yoon-Mo, was arrested April 6 as he and other residents of Gangjeong village disrupted construction by locking themselves under the earth moving equipment. Yang, who was released from jail just three months before, following an earlier protest, was jailed again for violating a restraining order. He has refused food since that day, and declared his willingness to fast until death unless plans for the base are abandoned. 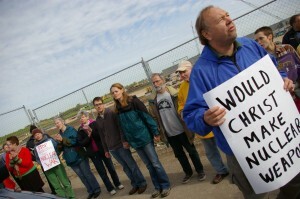 On May 19, eight more opponents were arrested and are also in jail. One of them, Sung-Hee Choi, was taken into custody simply for displaying a banner that read “Do not touch any stone or any flower.” She, and perhaps some of the other prisoners, have joined with Yang in the hunger strike. Federal arrests at Y12, July 5, 2010. Bonnie Urfer, Sr. Jackie Hudson, Sr. Carol Gilbert, Sr. Ardeth Platte, Jean Gump and Steve Baggarly were moved on May 28 to the Irwin County (Georgia) Detention Center, a private prison under contract with the federal government. For all the prisoners’ current addresses, please see Inside & Out. Eight of the twelve Y-12 nuclear resisters convicted of federal trespass on May 11 in Knoxville, Tennessee will remain in custody in local lockups until their sentencing, after the seven not already in custody declared they would no longer accept supervised release. They were arrested last summer on the federal side of the fence at the Y-12 nuclear weapons complex in Oak Ridge, at the conclusion of the Resistance for a Nuclear Free Future gathering. Bonnie Urfer, Sr. Jackie Hudson, Sr. Carol Gilbert, Sr. Ardeth Platte, Jean Gump, Michael Walli and Steve Baggarly are all being held at the Blount County Adult Detention Center in Maryville. The men are reported to be together in one small unit, while the women have been split between two separate units. Fr. Bill Bichsel, who was already serving a three month prison sentence for the Disarm Now Plowshares action, remains at the Knox County Sheriff’s Detention Facility, where federal marshals had delivered him before trial from a prison in Washington state. 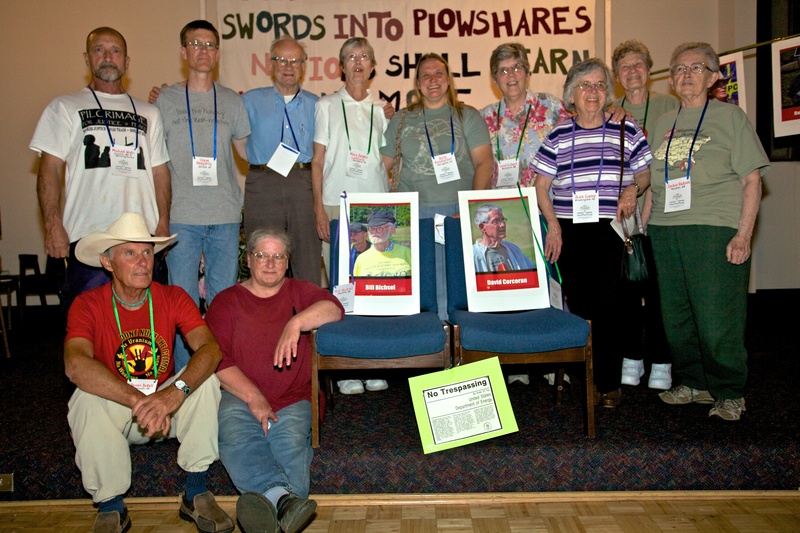 Twelve disarmament activists were convicted of federal trespass following a three-day jury trial in U.S. District court here during which the activists — under an order issued earlier by the court which effectively stripped the defendants of any substantive affirmative defenses — were prevented from questioning or even mentioning the outlaw status of nuclear weapons. The twelve were charged after a demonstration July 5, 2010 at the Y-12 nuclear weapons complex in Oak Ridge, Tenn. They face up to one year in prison and a $100,000 fine. No sentencing date was set, but seven defendants were taken into federal custody after they refused to return to TN for sentencing. 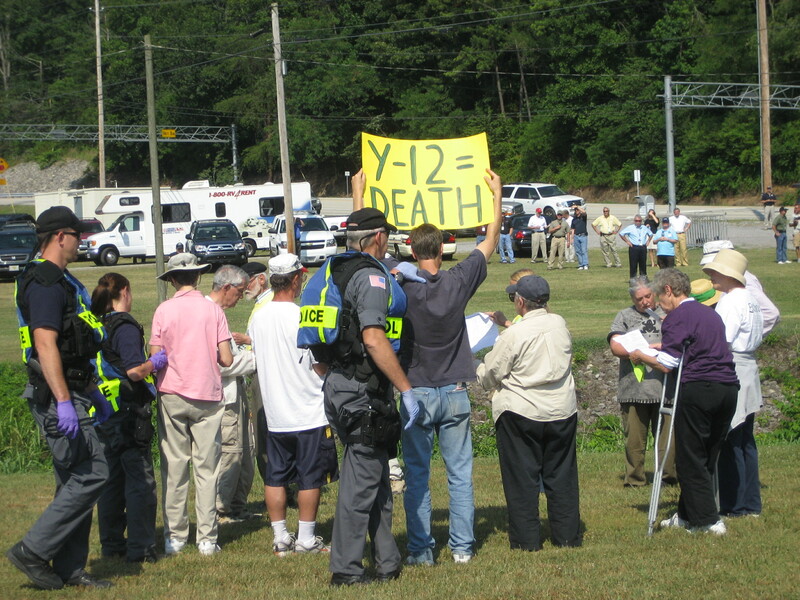 On March 4, 2011, Judge Bruce Guyton heard arguments about the government’s motion to limit the testimony that Y12 resisters could give at their trial for crossing the line at the Y12 Nuclear Weapons Complex in Oak Ridge, Tennessee. On April 29, he issued his ruling—granting the government’s motion and precluding defendants from making any arguments related to international law, necessity, nuclear weapons policy, their religious faith, morals or good motives. The government got virtually everything it wanted—the judge had put a gag over the mouths of the defendants. And then, for reasons that may never be known, the government took the gag off. The first government witness, Ted Sherry, site manager of the Y12 Nuclear Weapons Complex, took the stand and, in a matter of minutes, mentioned deterrence, US nuclear policy, and nonproliferation, opening the door for the defense to talk about these things. By the end of the day Tuesday, the second day of the trial, they still hadn’t managed to shut the door. 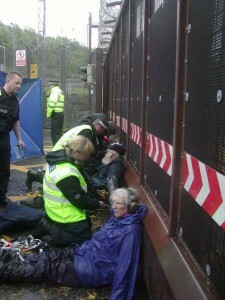 Trident Ploughshares and Faslane Peace Camp activists in Scotland jointly blockaded Faslane starting at 7 a.m. on May 10, shutting down the Trident submarine base for two hours. 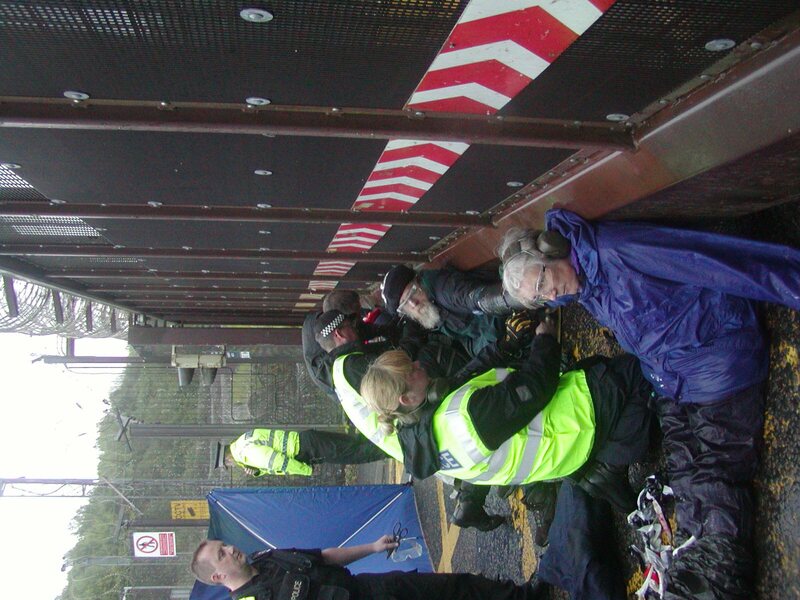 Four members of Trident Ploughshares blocked the North Gate of the base while six Peace Campers blocked the South Gate by locking themselves together. Just four days after the Scottish elections the activists called for the anti-Trident SNP government to fulfill its commitments and demand immediate disarmament of Trident and a global ban on nuclear weapons. All 10 were arrested for Breach of the Peace. The six from the peace camp were released from jail after 12 hours. The four from Trident Ploughshares were to remain in custody overnight and go to court the following day. Poulsbo, Washington, Saturday, May 7, 2011 – “Disarm, Disarm! The Sword of murder is not the balance of justice” rang out as nuclear resisters symbolically closed the United States’ largest operational nuclear weapons base. 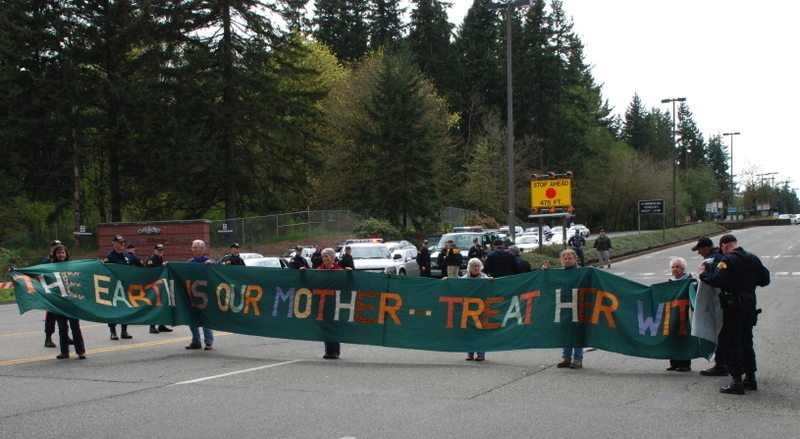 Eighty-three people gathered at the Ground Zero Center for Nonviolent Action on Saturday to celebrate Mother’s Day weekend, honoring nurturing women and resisting the Trident nuclear weapons at Naval Base Kitsap-Bangor in Kitsap County, Washington. At dawn on Monday, May 2, Greenpeace activists began blocking the construction of the European Pressurized Reactor (EPR) under construction at Flamanville, France. Two trucks were anchored to the ground, blockading the entrance carrying activists. More activists scaled four cranes, attempting to impede further construction work at the site. KANSAS CITY, Mo. — Fifty-two peace activists, most connected to Catholic Worker houses throughout the nation, were arrested here May 2 after blocking the gate to the construction site of what will be the nation’s first nuclear weapons production facility to be built in 33 years. 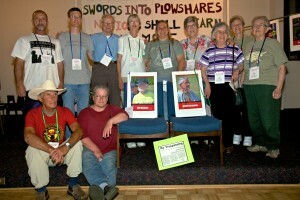 The acts of civil disobedience came 78 years and one day from the founding of the first Catholic Worker community by Dorothy Day and Peter Maurin, and were the culmination of a three-day “faith and resistance” retreat hosted by two Catholic Worker communities, which drew some 150 to this city.